This updated manual presents information, practice tests, and strategies for the different question types used by police departments throughout the country. 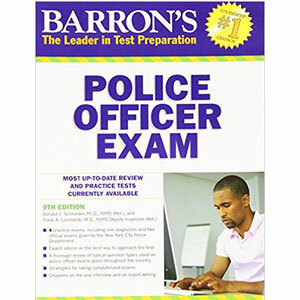 It includes Four full-length practice exams with all questions answered and explained Two official exams given by a large metropolitan police department Strategies for taking computer-based multiple-choice tests, as well as for the traditional paper/pencil multiple-choice exam New reading comprehension question type with word selection questions, plus strategies for answering these questions New, up-to-date sample forms and new illustrations. An additional diagnostic exam presents questions like those that have appeared on recent entry-level exams used by police departments across the country. Also included are test-taking tips for all question types, suggested rules for effective study, and a detailed description of a police officerâ€™s duties. Updated chapters take into account the recent trend by police departments to rely on oral interviews and computerized testing when selecting police officers.